Go fast…turn left…don’t crash (except for THAT driver)! I wanted to wait until the smoke cleared before commenting on yesterday’s race. I am still very, very upset, but calm enough to report on the race. Some of THAT driver’s quotes regarding HIS on track incident with Mr. Matt Kenseth. From the replays, it did look like Matt slowed up a bit–one to avoid Casey Mears (THAT driver’s future teammate), but here wasn’t anybody behind THAT driver. I would think THAT driver could have slowed up to avoid hitting Matt. UGH!!! In my opinion, THAT driver wanted to get Matt back for the Bristol incident and what better way in THAT driver’s mind, but to take a VICTORY away. 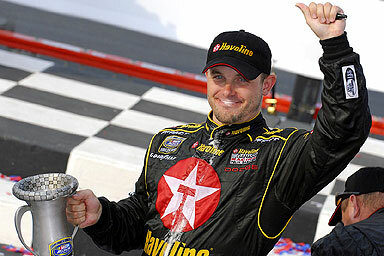 Just remember little man, sometimes the NASCAR Gods have a funny way of getting sweet, sweet revenge. Besides isn’t THAT driver the same one who gets all whiney when someone does the same thing to him??? And the commentators were having their own THAT driver love fest as well. UGH–enough already. I wished I could have been there because I would have thrown something at THAT driver too. The commentators said it was a low life thing for the fans to throw things at THAT driver and it is bad for the sport. What about what he did??? I even watched Victory Lane to see what ol’ Jimmy and Kenny had to say, but ugh..enough with the love fest. Note to Matt–Postman suggest you take out THAT driver at Richmond, especially if THAT driver is sitting in 10th place. Talk about sweet revenge. Smoke started towards the back but quickly made his way towards the front. For awhile it looked as if Tony was going to challenge for the win. I was hoping for a top 5 finish, but he ran out of gas late and finished a dismal 32nd which moved him back to 7th in the standings. However, Smoke finished 9th in the Busch race on Saturday. Elliott had a dismal time in Chicago. I guess Chicago isn’t Elliott’s kind of town. He finished 29th yesterday (3 spots better than Tony) and 38th in the Busch race on Saturday. Plus we didn’t get a full hour’s worth of Mr. Sadler on Trackside either. Oh well…a little bit of Elliott is better than no Elliott at all. Congratulations to Casey Mears for winning his first race in any NASCAR division. I don’t know if I can cheer for you next year since you are going over to the Dark Side. Postman did pick Casey this weekend as his driver for his contest and what did Casey do for Postman?? Casey finished 25th. Of course, I informed Postman not to pick Casey despite the fact that Casey ran good for him earlier in the year. I told him to pick Greg Biffle. Guess where The Biff finished yesterday?? That’s right my friends 11th! Of course Postman should know by now not to pick either Kasey or Casey. Every time he does, they crap out on him. On to New Hampshire boys..buckle up my friends, it’s going to be a bumpy ride! I’m thinking we can get Danica to take the big queen out…. Show the pisser no mercy ! Just wait ’til next year you skunk !